Personal observations on how the use of seven elements has shaped human civilizations. 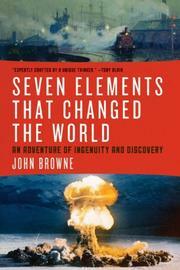 "Over the course of my forty-five years in business, including twelve as the leader of BP, I saw the very best and the very worst that the elements can do for humanity," observes former British Petroleum CEO Browne (Beyond Business: An Inspirational Memoir from a Visionary Leader, 2011) at the outset of this idiosyncratic survey. The author has selected seven elements he believes have been prime contributors to the building of the modern world: iron, carbon, gold, silver, uranium, titanium and silicon. Regarding each element, he reaches back to its use in the ancient world or more recent discovery and then examines the changes each has wrought throughout history. Any such selection will be arbitrary; for example, some may puzzle over his choice of titanium as one of the seven instead of copper, which gave us developments from the Bronze Age to telegraphy and telephony, passed over since “electrical engineering will have its fair share with silicon.” Browne makes cameo appearances throughout the book, generally in the course of rubbing elbows with the powerful, and the exposition is clearly shaped by his interests and experiences. Having spent a lifetime in the oil business, he has much to say about carbon as a fuel but never mentions plastics, and his collection of more than 100 glass (that is, silicon) elephants appears alongside the development of semiconductors. Such quirks aside, the topics the author chooses to cover, ranging from the use of coal in ancient China to the Bessemer converter and silver photography, unfold in thoughtful detail, and the ample footnotes accompanying the text are as diverting as they are helpful. Somewhat entertaining but lightweight stroll through some of the chemical underpinnings of the modern world.